Normandy Life: Mosaic Monday # 26. The Good, the Random, the Fun. Mosaic Monday # 26. The Good, the Random, the Fun. One of the great things about Mosaic Monday is the inspiration that I get from visiting the blogs of all of you who participate each week. Reading about where you live, your families; homes; hobbies and passions seems to spark my own creativity leading me to think "outside the box" to find new interests and expand the range of blog topics. Despite my best efforts I still haven't mastered the ability to capture images of the birds who come into the garden to avail themselves of the daily buffet laid out for them on the bird table, so I can't blog about that. With the weather so cold and bleak this past week we haven't ventured out too far from the fireside, so I was asking myself what can I bring to Mosaic Monday this week when I remembered Linda's post "Late January Random-osity; the Good, the Random the Fun" @ The View From Squirrel Creek. could be brought back to it's former glory. Is this the fixer-upper of your dreams? are you a fan of Agatha Christie's Miss Marple? I'm afraid to say I'm hooked on them, such fun. Have you been inspired by other bloggers and discovered a new interest, author or hobby? Don't keep it to yourself, leave me a comment and tell me more! It's hard, sometimes, to find blogging inspiration in these cold months when all one wants to do is huddle by the fire. You've done brilliantly! 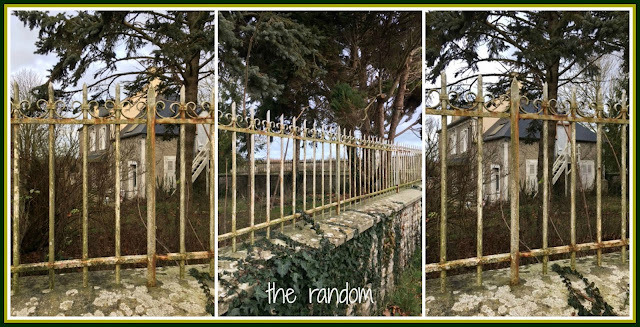 I'd love to own an old house in France and have the wherewithal to fix it up properly. I'm often inspired by other bloggers to try different things. From this post of yours I'm going to be checking out Clara Benson's books - I've not heard of them before and I do enjoy Agatha Christie. Thanks for hosting MM, Maggie, and have a wonderful week! 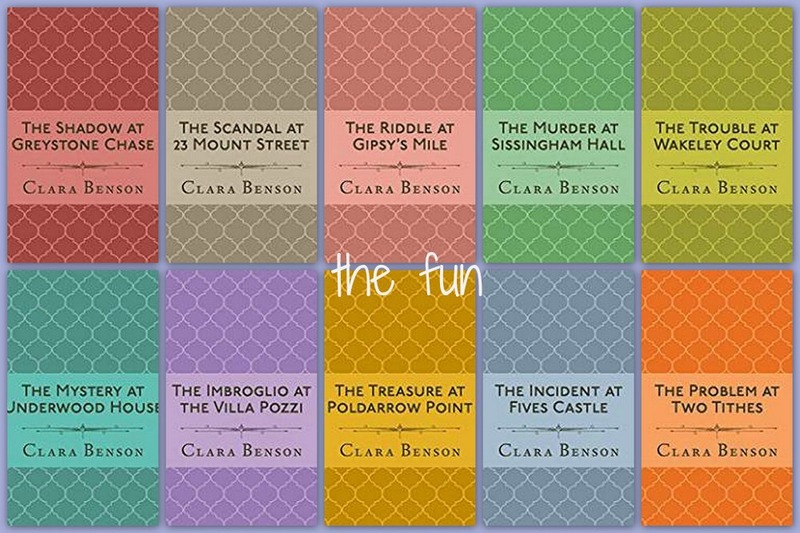 I just learned about Clara Benson's book series from you, Maggie! Thank you! I've read all of Agatha Christie's mysteries so I know I'd enjoy these. Every blog and blogger teaches me something, big or small. Blogs are a wonderful way to travel the world or learn a new recipe or craft. Maggie, I love the idea of sharing the three - The Good, The Random, The Fun. I'm going to remember that. Now I want to check out Clara Benson's books. It's been rather cold and gray here too, but today finally brought a bit of warmth and sunshine. Actually I'd rather see the cool temps stay with us for the month. Readying for Valentine's Day around here, enjoying my little heart vignettes here and there, and planning a dinner for friends here on the 13th. Thanks for hosting, Maggie! 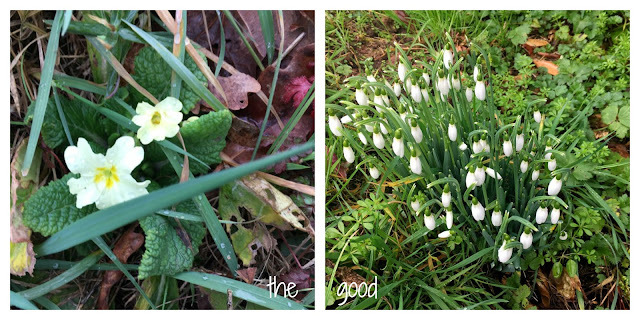 With my garden buried under snow and ice, it's reassuring to see your primroses and snowdrops. I have purple and yellow primroses on the sill above my kitchen sink to remind me of springtime. I always like to hear what others are reading and getting recommendations from them. Thank you for hosting MM Maggie. Hi Maggie, I always get inspired from visiting others. From home decor to lovely gardens and DIY projects. Just wish blogging had been around in my day! I have read a lot of Agatha Christie’s mysteries. I need to pull some of those out for another read. Last week we were promised another six weeks of winter, hope it isn’t so. My daffy are up and ready to bloom anyway, the promise of spring. Keep warm by the fire, I’m sure spring is just around the corner across the pond. Thanks for hosting. I read all the Agatha Christie novels when I was in High School. Thanks for the Clara Benson suggestion. I'll read a couple and see how I like them. Seeing bright, petite and pretty flowers sprouting wildly in the countryside is inspiration in itself, right? I am longing for spring and to plant some of my own flowers in the now dried up earth in clay pots. The abandoned abode, to me, is still beautiful. Albeit, if it were given some TLC, it would, undoubtedly be breathtaking. I find such situations so sad, especially when I begin to imagine the life that once upon a time must have inhabited such a stunning piece of architecture. What fun. I do like mysteries and I'll see if that author is available at our library. My husband would enjoy fixing up that neglected house. It's so sweet to see winter flowers pop up. My Lenten Rose is coming up nicely. Today we are having snow in the Seattle area and many schools are closed. I hope to get out for a snow walk! A lovely collection of Januaryosities! I am intrigued by the books, but daren't look any further, too many books, too little time!!! I always enjoy learning about new to me authors. I might have to start another series! One of the best things about blogs .. all the new and different ideas. the wonderful house is just waiting for someone to come along and love it! Fun seeing blooming plants. Happy Monday and thank you for hosting! Thank you Maggie for your 26th Mosaic Monday. We have been have unusual weather for Coastal BC (near the US border) with snow, snow, snow, more snow both in December, January and February. Normally all we have is rain so the cities are not equipped to clear an not major streets in a timely way, lots of vehicle accidents, lots of shovelling and then shovelling again. Today was the first snow day school closure (thank goodness because trying to get to school is quite dangerous on the snow clogged streets). Main highways are clear though. Always so charmed by your stunning posts, I'm thanking you wholeheartedly for hosting, darling Maggie ! I made a note of this new (to me) author ...I love anything Agatha and was sad when I realized there were no more Miss Marples to be read. Bloggers do inspire me .... to visit new places....to take better pictures .... to read new authors.....to try new recipes ... and above all to stay interested in life and new experiences as I age. Thank you for your inspiration! I went to Amazon and found the first book in this series by Clara Benson for $1.29! It's an ebook that loads right onto my IPAD so I'll start it soon! The rest of the books in this series cost more...of course! lol Hugs! I've never heard of Clara Benson -- I'll check these out. I'm into the Deborah Crombie Duncan Kincaid/Gemma James mysteries. They're good too! Fun blog - love the fence around the old house. I was inspired by Diane at Lavender Dreams to start making doll clothes for my 18 inch Madam Alexander Dolls (similar to American Girl Dolls). Now we have a post about our dolls each Wednesday. Other blogs inspire me to look at things differently and to try new ideas. What a delightful surprise that you mention my blog! Thank you and good luck with the birds! Were I younger, richer, more adventurous I just might take on the old house. A nice dream isn't it? I can find things to write about besides gardening, but I sometimes wonder if my readers would be interested. I suspect that it is that old adage you can please some of the people some of the time, but not all of the people all of the time, and I must keep that in mind I do like your idea of coming up with a theme: the Good, The Old, The Odd--a list of various combinations could go on. Have a wonderful day. Clara Benson is a new writer to me. But if I find one, I'll tell you Maggie!